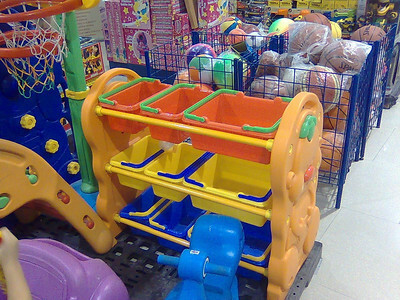 Toy racks are great space savers and organizers. Your toddler can easily see and get to see his favorite toys and he can also put them back according to his own system. He is more likely to come up with his own classification system anyway because he will notice that some things can't go in the lower racks (the bulkier toys) and that it's better if he put his dinosaur stuff together and his toy tools in a separate bin. And although you're unlikely to put Ferrari parts there, such toy racks can also serve a great purpose in closets and garages, maybe even the pantry. It is at least easy to clean. You just have to get a really sturdy set. And if you can't find one, you can always make do with shelves and separate bins. This one, we found at Robinson's Place (3rd floor, toy display outside the department store) at P2,400 I think. It's a fairly big one, more appropriate perhaps for bigger kids (or one with just so much clutter). Naku... ako nga, I really let go of some of the toys... and I forbid my hubby from buying a lot kasi andami nagreregalo :D Our kids are sooo lucky!